1 Seat Depth: The distance from the back to the inside of the knee. 2 Back Height: The distance from the base of the seat to the top of the back. 3 Seat Width: The distance from the left side of the seat to the right side of the seat. Ideally the widest part of the body should fit comfortably with an extra inch to spare for movement within the seat. 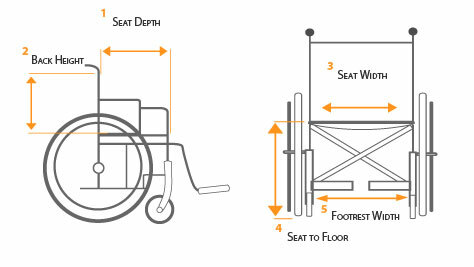 An 18″ seat is the usable seat width. 4 Seat To Floor: The distance from the edge of the seat to the floor. 5 Footrest Width: The distance between the left footrest and the right footrest.